Do you have a pet? Or have you ever had one? I remember having my first pet at the age of 10. 'twas a kitty that my aunt gave to me as a surprise at the eve of my birthday. I was sleeping when I felt something scratching my head. I got scared at first, I know everybody else are downstairs busy preparing for my party the next day so who could that be? And I was pretty sure I felt some fur brushed my forehead too! I took a deep breath and opened my eyes...and there it was. A cute little kitty, staring back at me. But before you think of my Mom as a kontrabida in a teleserye, she totally changed a lot after we got Britney. Britney's a pure breed shih-tzu and our first pet who actually lived with us inside the house. In fact, she was baby-ed so much that we think she actually forgot she's a dog. 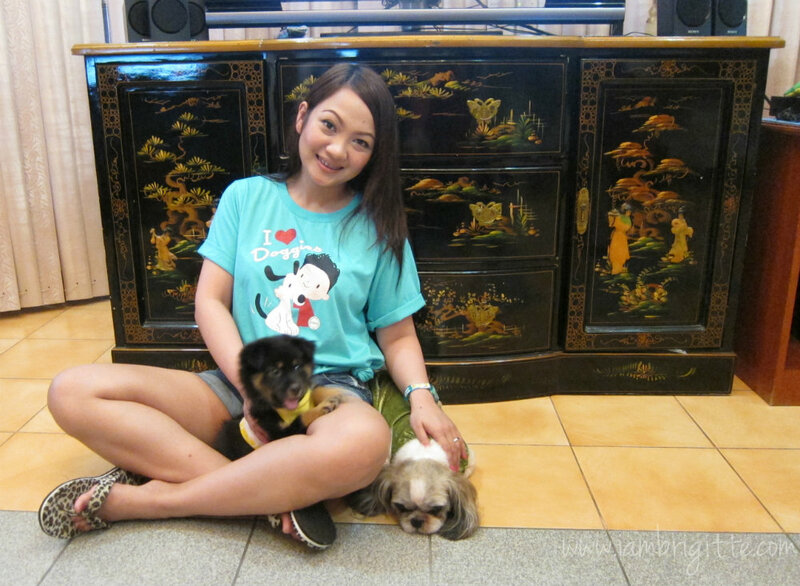 (laughs) Mom who used to hate having a pet inside the house, most especially when they start pee-ing and poop-ing everywhere, turned into a dog-mommy! She treated Britney like a baby, looking after her all the time, and she even misses Britney more than she misses us! She really took good care of Britney. I remember she would prepare Britney's food first, before hers. She would give her a bath, remove fleas, everything. Britney's not with us anymore, as well as her first born Bogart (sniff), but I am pretty sure they felt loved and wherever they may be right now, I know they are happy that they became a part of our family. We have other dogs aside from Britney. There's MAC (my baby) and we got another one, named Maldita, because she's too makulit, and my sister's Hailey. We also have other dogs outside the house, and though they don't live with us inside our house, they are also loved and being taken care of. that's my sister's baby, Hailey...and hmm, Dora? We have a LOT of dogs outside I seriously can't remember each of their names! And that's MAC on my right. I don't think he's too happy seeing Hailey with us! Yeah, he's seloso! MAC: That's my Mom, go away! At a young age of 10, I already know how to take care of animals. So it really saddens me whenever I would see people being cruel to them. There was even a time when I saw a footage of dogs swimming for their lives during a big flood. I was wondering, why did they leave them behind? I remember one time when I saw a man kicked a stray dog just because the dog's following him. I wasn't able to contain my anger that I shouted at him, "Do you really need to do that!?" Our family loves animals. We even had a Maina bird as a pet (who also passed away after being with us for 15years) to whom we talked to as if she's another human being. I remember the way she would say "Hello?" whenever the phone rings that our helper would think somebody already answered the phone. And yes, I will not forget those times she would say "Taba, Taba" or "Takawwww" whenever she would see me. And this is our favorite spot in the house, it's where we watch TV while these doggies get a good 'ole scratching on their tummies or heads. I wish everybody would give our furry friends some lovin', they are God's creations too! So please, please, stop cruelty to animals. 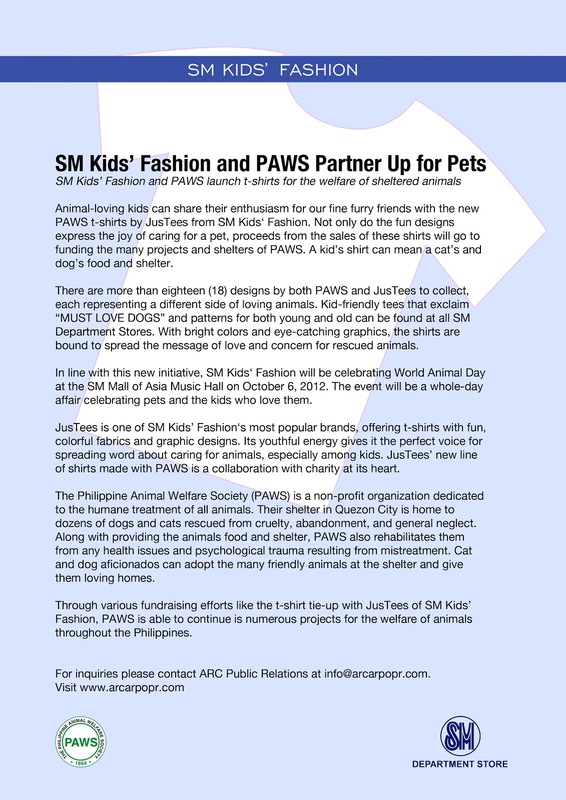 If you don't have a pet, but would still want to give them the love and care, you can do so by buying your own PAWS shirt made by JusTees of SM Kids Fashion. 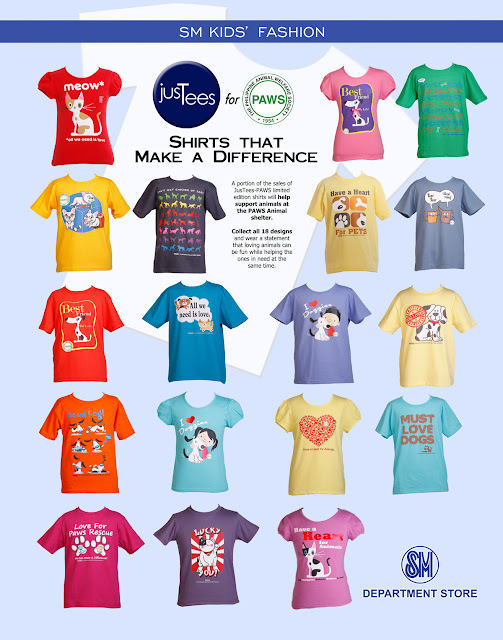 Not only do the fun, and cute designs express the joys of caring for a pet, a portion of the sales will go to PAWS -- a non-profit organization dedicated to the humane treatment of animals, and give food and shelter to those who have been victims of cruelty, abandonment and neglect. Yours truly wearing my "I love Doggies" shirt. These shirts are for kids, buy they are available in big sizes too. Mine I think is the biggest size. The designs are so cute, I am definitely grabbing some to be given as gifts for my inaanaks for Christmas. Children must be taught the importance of taking care of pets and being kind to animals at an early age. I believe that having pets at an early age will help kids be responsible. Am I right, or am I right? 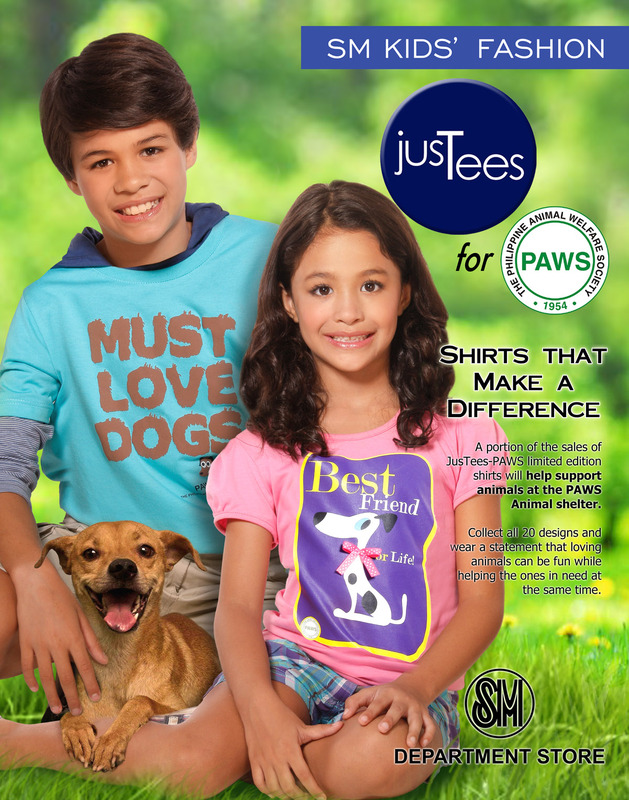 So again, give our furry friends the love and care they deserve by buying these cute tees from JusTees of SM Kids Fashion. Even the young at heart will surely love these. Ahh, this post makes me miss our babies!